The unemployment rate is the number in the civilian labor force divided by the number of unemployed. Everyone without a job isn't necessarily unemployed, at least according to the Bureau of Labor Statistics. To be counted in the unemployment rate, you not only have to be without a job, you have to have actively looked for work in the past four weeks. If you were temporarily laid off and are waiting to be called back to that job, you're still counted. If you've given up looking for work, you're not counted in the unemployment rate. Many people argue that the real unemployment rate is much higher, since it should count those discouraged workers. The unemployment rate is reported by the BLS on the first Friday of each month. It is useful to compare this month's unemployment rate compared to that of the same month last year, or year-over-year. This rules out the effects of seasonality. If you only compare this month's unemployment rate to last month's, it could be higher because of something that always happens that month, such as the school year ending. It may not indicate an ongoing trend. Obviously, the unemployment rate is important as a gauge of joblessness. For this reason, it's also a gauge of the economy's growth rate. However, the unemployment rate is a lagging indicator. This means it measures the effect of economic events, such as a recession. The unemployment rate doesn't rise until after a recession has already started. It also means the unemployment rate will continue to rise even after the economy has started to recover. Why is that? Employers are reluctant to lay people off when the economy turns bad. For large companies, it can take months to put together a layoff plan. Companies are even more reluctant to hire new workers until they are sure the economy are well into the expansion phase of the business cycle. During the 2008 financial crisis, the recession actually started in the first quarter of 2008, when GDP fell 1.8 percent. The unemployment rate didn't reach 5.5 percent until May 2008. It reached its peak of 10.2 percent in October 2009, after the recession had ended. In the 2001 recession, unemployment went from 5.6 percent in 2002 to 6 percent in 2003, even though the recession ended in 2002. For that reason, the unemployment rate is a powerful confirmation of what the other indicators are already showing. For example, if the other indicators show an expanding economy, and the unemployment rate is declining, then you know for sure businesses are confident enough to start hiring again. See how this worked in U.S Unemployment Rate by Year. The unemployment rate is an important indicator the Federal Reserve uses to determine the health of the economy when setting monetary policy. Investors also use current unemployment statistics to look at which sectors are losing jobs faster. They can then determine which sector-specific mutual funds to sell. The year-over-year unemployment rate will tell you if unemployment is worsening. If more people are looking for work, less people will be buying, and the retail sector will decline. Also, if you are unemployed yourself, it will tell you how much competition you have, and how much leverage you might have in negotiating for a new position. When the unemployment rate reaches 6-7 percent, as it did in 2008, the government gets concerned, and tries to create jobs through stimulating the economy. 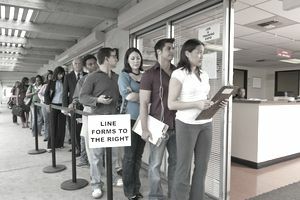 It may also extend unemployment benefits to prevent the recession from deepening. Studies show that extended unemployment benefits are the best way to boost the economy. Monetary policy can also be used to lower unemployment. For more, see Unemployment Solutions. The unemployment rate is a critical component of the misery index. The other component is the inflation rate. When the misery index is higher than 10 percent, it means people are either suffering from a recession, galloping inflation, or both. Unemployment peaked at 10.2 percent in October 2009. It rose steadily from its low of 4.4 percent in March 2007. It did not really become a concern until a year later when it broke above 5 percent in March 2008. By then, the economy had contracted. The unemployment rate rose rapidly, breaking 6.2 percent in August 2008, 7.2 percent by November 2008, 8.1 percent by February 2009, 9.4 percent three months later, finally reaching 10.2 percent in October. The recession may have caused a new natural rate of unemployment because of all the long-term unemployed. This creates a high structural unemployment rate, since their job skills no longer match the new jobs being created. For the latest U.S. unemployment rate, see Current Unemployment Rate Statistics. For current employment statistics, see Employment Statistics.